As planned headed into campus mid-morning and grabbed a pile of books on philosophy. Spent a couple of hours flicking through them for inspiration for my book review essay, with a little bit of success in that I began to see a bit more of the essay taking shape in my head. Decided early afternoon to take them home to work…only to discover I’ve maxed out my library ticket. This is somewhat of a trauma as I can’t remember ever borrowing up to the maximum on my library ticket since I was a tiny llama who could only borrow three books from the local library’s children’s section! I get 24 loans – as does every postgrad and staff member. Think that’s a bit mean really, I could do with it being closer to 40-50! Debated either photocopying chunks of them (since I get free photocopy credits) or PDFing them with my phone, but in the end just made notes of the ones I couldn’t take and left. Once back home, and post a late lunch I did some searching for articles related to my reviewed book’s themes and key philosophers. After about an hour or so of this gave up, as virtually all the articles I found were far too detailed (and difficult to read) for purposes. Guess I’ll stick to working with the books then. Ended the afternoon writing up the revisions I’d made to the essay draft and adding in the references I already have found that are relevant. Not the longest hours I’ve worked, nor do I feel I’ve broken the back of the essay yet. But, I am happy to be making slow progress on it – and this time editing down content as I go, rather than trying to cram a 2,000+ word monster into 1,000 words. Hopefully the first polished draft mid-week should be around the 1,000 mark naturally, which will make for an easier editing process. Meanwhile, still not heard back from my supervisors on my research proposal. Know they’re busy but it’s been ten days since my last submission, and I’m getting a bit anxious that time is ticking away – and I really ought to be organising my review meeting with my internal assessor. But I can’t do that if my proposal is still not up to snuff. I think it’s time tomorrow to do some supervisor management…a subtle, gentle prod required via email! Chickened out of mailing my supervisors (though I’m going to make myself mail them once I finish writing up today’s blog entry – no more procrastination Mr Llama!). Spent the day mostly slowly slogging through trying to make the philosophical book review work. It still doesn’t really, and the philosophy part of it needs so much beefing up right now, it’s more horse than bovine. Highlight of what was a dull day (metaphorically, metrologically and mentally) was speaking to an old colleague and friend and hearing that changes were afoot at UKOLN*. Have to say I was more than a little shocked, though I think we spent more time gossiping about more mundane matters. Rather nice to have a professional conversation again though, I miss the cut and thrust of the various folks whose paths I crossed semi-regularly in the past 6 or so years. I hope that in time I’ll get a few more professional contacts to chat with in my new field! *See the article Looking Ahead. Started the day having a little browse through a How to write your thesis online guide (thank you Elearningcolin). I confess my face is so hard up against the early hurdles that I really haven’t had the time/will/energy to think about this really at all. So for now, I’m bookmarking it to come back and look at once I finally clear the research proposal and research practice course (RPC) coursework obstacles! For the record my group’s answers were 1) An idealised state or society 2) Negative (this being my input) – as achieving it takes away the necessary drivers for human accomplishment and 3) Unlikely, which probably means it’s not that negative. I’m not suggesting they’re the right answers, but it sparked of an excellent discussion before we delved once again into some more African cinema, this time from Guinea-Bissau director Flora Gomes (Mortu Nega – those whom death has rejected/sent back). Didn’t speak to me as much as the films we saw the previous week, but on analysis it had a fair amount to say in common with utopianism. Thursday started with a near hospitalisation and minor disaster. As you can see over on my Blipfoto account I managed to almost knock myself out with a falling paint tin. While injury was avoided splash damage wasn’t – I basically killed one of our rugs and turned the dining table into a Jackson-Pollock (underneath). Thankfully I did manage to clean most of the mess up, but the rug is pretty much a right off. Managed to explain it to Mrs Llama without her yelling at me (victory! ), but this is one of the occupational hazards when you have to work at home most of the time, and home is upside down for months of renovations and decorations. After this calamitous start and I’d calmed down I spent the day working on the essay and trying to assemble some sort of philosophical element within it. Not quite sure I managed it, but it did look closer to something I could hand in. I also got my official notification of the deadline for my research proposal (last day of March) and a request for my 6 month progress report. Wrote the latter of these quickly as my progress is mostly about trying to make progress (and reading…lots of reading). Sent it off to my supervisors so they can do their bit (and to remind them that my deadline is a bit close at hand). Not panicking. Yet. 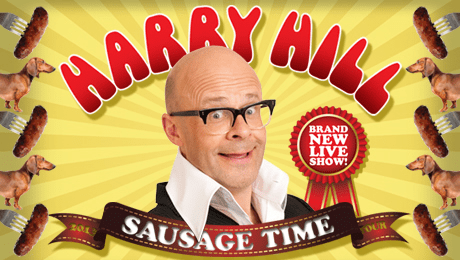 Knocked off just before 5 as I had to get ready to go and see Harry Hill: Sausage Time. Third tour of Harry’s I’ve seen, and once again he knocked it out of the park. If you get the chance, go see the show…just don’t sit too close to the front (we were in the third row…). Just what I needed to round off a day that didn’t start off that well. Up at the crack of dawn as we had a delivery coming. Thankfully it came around 8am so I won’t be waiting around all day. This let me crack back into the essay, which is nearing readiness To be honest its now at the word limit, has two pages of references and has all the sections finely balanced at about the right kind of lenth. Mostly a day off after my birthday (realised I’ve not actually had a day off since late September!) – driving back from Warwick, although I popped into campus to pick up 5 books on critical management and organizational theory. Or organisation theory if you prefer, UK folks. No emails. Cracking the ethnography and organisational theory books big time. Read the last two thirds of my second ethnography book (interesting clear examples of research in practice, not 100% sure it’s quite what I needed). Post lunch into a thick (500 odd page) organisational research and theory book – which was heavy, heavy going. Didn’t like the page layout (honestly WHO uses two column pages?!?! Is this the 19th Century ) And for a multi-author book I kept hoping against hope that each subsequent chapter would be written by someone who actually wanted to convey knowledge Sadly hopes dashed, so that when Mrs Llama reappeared just before 6pm, my head was slumped over the book. Not looking forward to going back to it tomorrow. Highlight of the day was the arrival of a massive parcel from my brother containing my birthday present…which you can see me wearing over on the right. Squark! And late evening an interesting proposal from my supervisor…which I can’t talk about just yet. We shall see where this one goes! My battle with the organisational studies book continued. Thankfully there were some better chapters, written in a more accessible style. All the same I was glad when the end of the day came. Only 125 pages to go (which at the speed I’ve been reading it will take about three hours of concentration to get through). Got feedback from my first mini-assignment which was positive; although considering the word limit was 150 words and the feedback around 300 I did think the tutor was slightly taking the piss. Next time I’ll write him a tweet length reflection instead! The plasterer was supposed to be in today, so I’d planned to work up stairs, but he cancelled so I had the run of the living room all day. The bleak, bleak, cold living room. Finally climbed over mount organisational studies book, although it took me all morning and a bit of time after lunch. I have managed to make at least four or so pages of notes and key quotes from it, so the time has been usefully spent; certainly I’ve some much better phraseology for writing the theory and method parts of my research proposal. I can even understand the flaws in my thinking in the previous version, that my supervisors point out last week. Making of sense of what I’m going to do, why and how is still the thing that keeps me awake at nights though. Lunch, if you’re interested, turned into two slices of toast and paté around 3pm. And after a week of hard frost and ice that just wouldn’t melt, today it’s grim outside and raining. Not to mention a tropical 7degsC outside. Almost shorts weather! And the plasterer is here, so today is going to be mostly spent typing up my notes on all the books I’ve read in the past week or so, along with going back over my notes and highlighting key things in them. I’m also going to start work on a timeline of events related to open access, A2K and the intellectual commons. Various dates have popped up in my reading, but I thought putting them all together in a time-bound way might give me some sort of useful insight. If all else fails it’ll make a useful coda to the literature review chapter in the thesis; and my supervisor agreed with me. I also need to update my personal glossary. It’s been handy having this to hand when I hit some unusual terms that have yet to become familiar (although I used positivism yesterday in a casual conversation with Mrs Llama so there’s hope). Might be a while before hermeneutics just rolls off the tongue though. Phrase of the week: fissiparous (runner up synecdoche) – 10 bonus llama points if you can get either of them into scrabble over the weekend! Mid-morning, and my best friend (librarian and all round good egg) highlighted this (working) 1960s version of Google. Nice! Right, only one week of full on work to go this year, though I think I’ll probably endeavour to re-read some of my texts over the Christmas period to make sure it doesn’t all go stale on me come the 2nd of Jan. But I think I’ll sign off this week right about here. And think about clearing up the mess downstairs. Wow, it’s December which means everything will just slow down in this last week of term. *Hollow laughter* Actually if anything this looks like being my busiest work week yet, as I’ve a crunch meeting with my supervisors this Thursday (I think, still waiting on a confirmation) to go through my project approval document. Which means today and tomorrow are set aside to little else except work on this and read up more on research methodology and theory. Beyond the meeting I expect to probably have to rewrite a fair bit of the proposal (not sure if that’s self doubt or just a realistic expectation , which will take me through the next week. Beyond that I want to catch up on my reading as I’ve a stack of papers I’ve just not had time to read yet. So if you’ll excuse me, I’d best get on. (Later) Hit a bit of a low point this evening, nothing a good night’s sleep won’t cure. Feeling a bit creatively burned out, so hope no one’s expecting any Christmas cheer from me any time soon! As per yesterday, editing, writing, rewriting – with a plan to send off the draft to my supervisors by the end of the day. As I’m in classes all day tomorrow there’s not really going to be much of a chance to do any more work on it in advance of Thursday; and I want to make sure they get a chance to at least read through it a bit beforehand. Horrid, wet and cold outside. Which is fine by me as I’m not going anywhere except between the dining table and the computer room today. Finished off the day by sending off my draft proposal to my supervisors, and submitting my first (all be it unassessed, uncredit bearing) bit of coursework. All 150 words of it – a reflection on philosophy. Another full on campus day, and a very icy start which saw me skid on the drive in (low speed, all is fine) and pass another car that had gone into a ditch only a few minutes beforehand. Didn’t relish the drive home after that! Attended a plagiarism and third party copyright training session in the morning. While I’m fairly clear on both (since I used to teach the latter at Leicester), it was useful to bone up on Turnitin from the student’s perspective. I think it’s interesting as a tool, not so much for spotting plagiarism for me but for spotting where I’ve forgotten to attribute something in my work. However, since I only get three goes at it each year I won’t be playing about with it too soon I suspect. Was fun to talk about copyright issues in theses though, and nice to be reminded I know something. Some days it feels like there’s so much to learn and so little I know – so a tiny boost to the ego every now and again is always appreciated. After lunch (hah! I spent it in the library printing things rather than eating) it was RPC time, the last session of the year. First up, despite what myself and some of the other students were expecting we didn’t have a session to review our aims. Instead we had a very useful session going through the paperwork and procedures around the project approval and transfer to PhD points in our studies. Considering I’d been working on the former for the past few days this couldn’t have been better timed. The head of the Graduate School gave it, and I was once more in awe watching a master of the spoken and pedagogical arts in flow. It takes a lot for a speaker to impress me, but consider me impressed. Although I think on some levels it put the fear of Grud into me again about some of the aspects. I’m sure it’ll all be fine and doable, but at times it felt more stick than carrot. This was followed by a session on Derrida and deconstruction given by the delightful Patrick. I think I took away something, but I’m going to have to think about it some more! High spot of the day was the good conversations I had with my various PhD fellows about our research proposals and interesting hearing from those who are further along the track with theirs (given their longer lead time in some cases) as I know I can learn from their experiences. Just hope in return I’ve been able to help them a little too. On campus again and an even colder (-4 overnight) start. Today I went to see my two supervisors to get their feedback on my research proposal. Ever since I’ve sent it in I’ve started to feel the fear – thinking they’d tell me it was total rubbish and I was wasting their time. Well okay, maybe not that bad but there’s always that feeling that at some point someone’s going to call you out as a total fraud and say “How DARE such as you even consider they’re worthy to do a PhD!!!“. I know, I know, paranoid much. However, it’s that little niggling doubt that won’t go away. As it was we had a very productive idea, and while as I expected we pretty much dismantled it they had some splendid suggestions for polishing it. Yes I’ll need to rewrite and restructure it a fair bit (writing is rewriting as it is said), but I’ve come away with a really good idea how I can just flesh out the bits I know were weak; and enhance other bits as well. Fair bit of reading to do over the next week or so before I want to put pen to paper again, but hopefully early in January I’ll be closing in on a good penultimate version. Went home via my second home (the library, honestly spending more time there than I did when I worked in one it feels like!) for more books and articles printed off, and then home via the shops. Just sat here typing up the meeting notes so I’ve got a good record of what we discussed while it’s still fresh in my mind. For light relief this evening, while Mrs Llama is out at her metal detector’s beard and rusty nail social (don’t ask) I’ll be writing a long overdue book review for a journal I write for! Yes, that pretty much sums up my social life right now! Reading. Lots of reading on theory and method; which is going to be a bit of a theme over the next couple of weeks I suspect. That and waiting for a man to deliver and install a washing machine (who didn’t appear until after 7pm). Just as well I wasn’t going anywhere. Had a few moments of the collywobbles mid afternoon after a few more suggestions came in an email from my supervisors, good ones but all the same I had 10 minutes of anxiety as in my head the research proposal started to morph into an uncontrollable gelatinous entity which I’ll never lick into shapes. Calmed myself down shortly afterwards, reminding myself it’s a long process and I’ve plenty of time. I just need to keep at it, do the research reading, rewrite it a few more times, pass it on for feedback as I gradually home in on the final version. All the same I will be glad when it’s done, even I totally understand the importance of having a firm foundation for my research work proper. It’s my birthday over the weekend so I’m taking half a day on Monday to relax. But other than that it’s going to be a long couple of weeks working right up to Christmas. Only question I have now is “How much time will I spend working over the Christmas break?” – don’t want to walk away from the proposal until the new year, but suspect Mrs Llama is going to be… difficult to work around once she finishes work for her couple of weeks off. Hmn, will have to play this one by ear I suspect.